All events and contests facilitated by us are posted in here. Usually a good source for prizes. If you have issues with the server, site or forum, please post them in here. 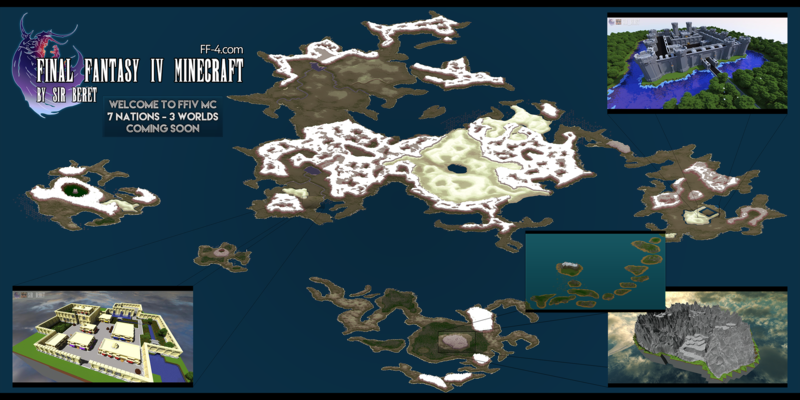 This forum is for suggestions on the map, forum or site itself and also any feedback pertaining to it. Meet with other players and post to your hearts content, a general discuss of casual sorts. Kupo! How many of you aren't bots? General discussion across all kingdoms. Declare war or discuss terms, trade, peace and more with opposing and allying towns. Discuss trade and barter on behalf of yourself, town or faction as you gather materials to establish yourself! Discuss any aspect of Minecraft itself. Have a screenshot you want to share? Post here and see what others think about it. Discuss any aspect of the Final Fantasy franchise! I suggest Final Fantasy IV! Or the very latest XV! or Tactics! Have a question about something ingame whether it's about the server or the game in general, post here to get a response! Discuss world news and politics going on in the world today. All things entertainment are posted in here: TV, Movies, sports, literature and music! We all love Minecraft and Final Fantasy! So how about other games? Post about them in here! Barring in-game screenshots, post anything else here such as your latest Photoshop design or graphic.Show off any other creation, participate in contests, and make requests. Post polls and surveys in the field to see what the rest of the community thinks! Post count does not increase here. Debate topics with the rest of the community. We're all tech-enthusiasts for the most part! Post about your latest rig, gadget or tech-inspired topic in here! Roleplay with the rest of the community, after all, this is a role-playing minecraft server/forum.